In advance of the final report of the Task Force on Student Life and Learning, President Charles M. Vest announced Tuesday evening that all freshmen will be housed in dormitories beginning in the fall of 2001. The Tech supports the decision made by the Academic Council as the best step towards creating a safe and secure environment for freshmen to spend their first year at the Institute. This decision is not a major surprise. In 1989, the Potter Committee, charged to study the impact of Orientation on the MIT community and especially freshmen, reached the same conclusion. While the report was disregarded by students as lacking sufficient student input and was not acted upon as a result of student outcry, the consensus remained for years among many faculty. This sentiment was reiterated last year when Professor of Brain and Cognitive Sciences Stephan L. Chorover proposed housing all of this year's freshmen on campus but later withdrew his proposal after students once again voiced opposition. 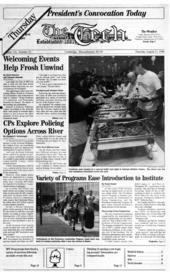 The Tech endorsed the housing of freshmen exclusively on campus last year, believing that this course offers more substantive opportunities for interaction between freshmen and the rest of the Institute and that it gives first-year students time to make an informed choice regarding housing. Fraternities, sororities, and independent living groups will undoubtedly have to change drastically as a result of this week's action. But they should realize that this decision is not disastrous. MIT has given the system three years to adjust and devise new plans for its continued viability. President Vest has stressed his desire that FSILGs remain a valued part of the Institute community, and has promised the Institute's assistance in preparing FSILGs for the imposition of the new system. It is reasonable for MIT to assist in meeting the financial burden inherent in this transition. As a result of this decision, several FSILGs may face closure. However, this consequence is a natural progression out of many of the events which cast doubt on the safety in the FSILG system occurring in the past year. MIT should work to retain the variety and diversity of FSILGs, but the Institute should not go to great lengths in lending life support to all chapters, in particular those with a record of behavioral problems. Student leaders from both dormitories and FSILGs should now work together to discuss the changes coming upon the implementation of this system. Open discussion and cooperation in planning now will help smooth this transition for all parties involved. The administration could have done a better job in coordinating this announcement, as Tuesday morning students were led to believe the task force issues could be ignored for the duration of Orientation. This misstep has caused a certain amount of distrust among students about the motives surrounding this decision as even student leaders were kept in the dark until the 11th hour. The administration should have announced the upcoming decision as soon as possible to show good faith with the student body and dispel notions of the decision remaining clouded under a veil of secrecy. President Vest and the task force deserve commendation for taking this difficult decision. Although this announcement will be unpopular with large segments of the MIT community, it is the right decision to make. And while the conclusion may relieve pressure on MIT from the external media, President Vest has stated that his motivation for reaching this decision is the administration's "commitment to enhancing our educational community and better integrating student life and learning." The entire Institute community must now move forward and work together to ensure that the many benefits this decision may bring will come to fruition.